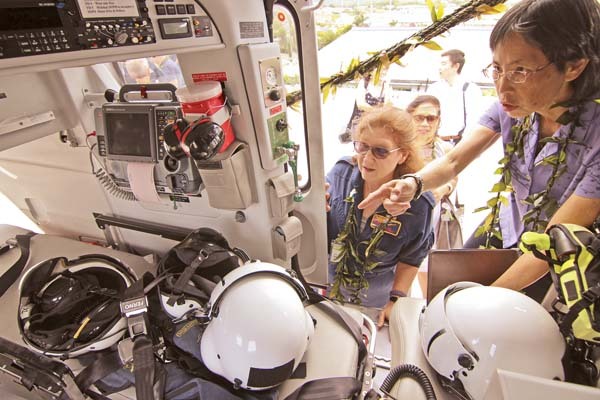 WAILUKU — Soon after a blessing concluded for Maui County’s new medevac helicopter, the twin-engine craft took off from Maui Memorial Medical Center’s helipad to retrieve a Hana patient. 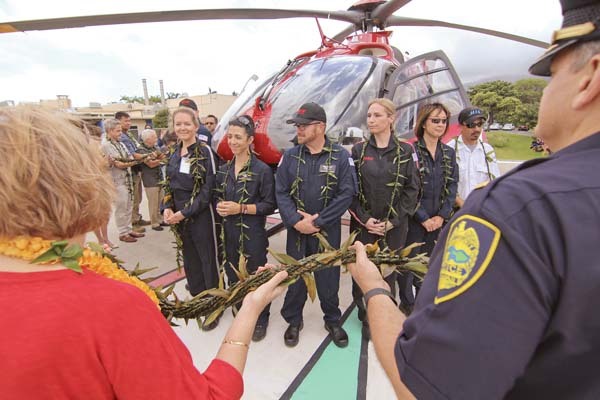 Dozens from the ceremony watched as the Eurocopter EC135p2+ did its job, shortly after it was adorned with a giant lei and blessed by its crew and hospital officials. 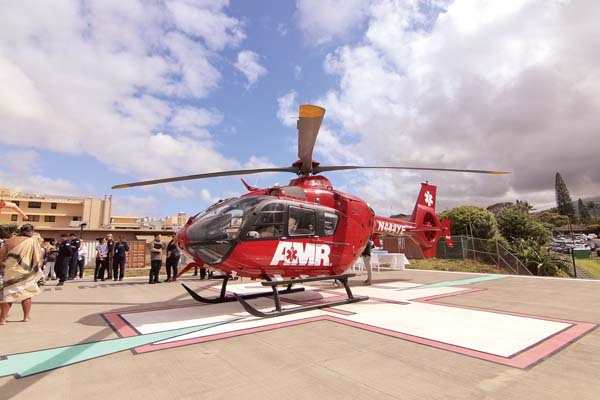 The ceremony was for REACH Air Medical Services and its helicopter, which began its official medevac work as new subcontractors for American Medical Response last week, Jesse Van Hook, REACH’s chief pilot on Maui, said prior to the blessing Tuesday afternoon. American Medical Response is Maui County’s EMS/911 ambulance provider under a state Department of Health contract. Curt Morimoto, Maui County operations manager for AMR, said its previous subcontractor, Pacific Helicopters, decided to relinquish the medevac operations portion of the company back to AMR to concentrate on tours and other commercial operations. The former helicopter was a Bell-222UT. Training with AMR medical crews and REACH pilots was completed last month, Morimoto said. Pilot Emery Lee, who made the transition over from Pacific Helicopters to REACH Air, was flying the mission to Hana on Tuesday afternoon, Morimoto said. Morimoto added that when the medical calls come in, the pilot does not know the status of the patient, in order to prevent the pilot from getting nervous or feeling pressure based on the details of the call. But the crew is dispatched separately and is informed of the patient’s condition. The red, twin-engine helicopter that took off Tuesday is not a new craft, but it brings new technology to the medevac service. 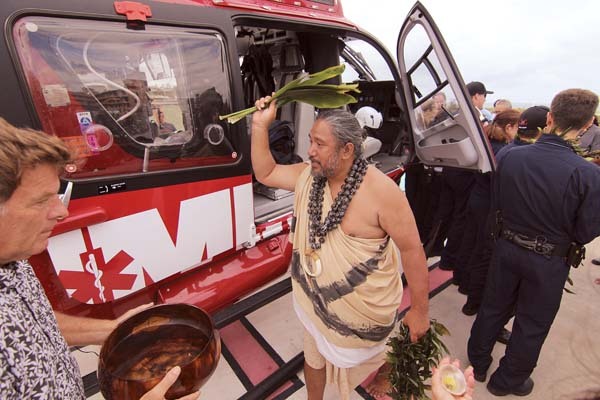 Kapono Kamaunu of Maui Nui O Kama sprinkles water along the helicopter during the blessing. Now the crew operates with night vision goggles and the helicopter has autopilot capabilities to assist with flying in low visibility, pilots said. Van Hook said with the night vision technology, the crew can go from seeing pitch-black conditions to seeing even wires when flying. The crew will use the goggles during takeoff and landing. Paramedics will put the goggles aside to work on the patients in flight, he said. The service, which operates 24 hours, seven days a week, focuses on transporting serious to critical patients from faraway rural areas such as Hana, Molokai, Lanai and West Maui to Maui Memorial Medical Center’s emergency room. The helicopter flight significantly shaves off commuting time via ambulance. Dr. Libby Char (from right), medical director for AMR, and Candy Lahm, chief flight medic for AMR, inspect the inside of the new helicopter. For example, Van Hook said a trip to Hana via the helicopter could take about 20 minutes. Then 10 minutes would be spent to load the patient, then another 20 back to the hospital. Last year, the service had 30 missions; in 2017 it had 68; and in 2016, 48. The service began in September 2004, and in total there have been 635 medevac transport missions, Morimoto said. Mayor Michael Victorino also touted the service. He said he sees the helicopter and knows it’s something serious for the craft to be flying. He thanked various officials as being partners with the county for the lifesaving mission. Maui County also pays for the service along with the state. Dr. Alvin Bronstein of the state Department of Health said Maui County puts in close to $700,000 annually for the service, with the state picking up the rest. For this fiscal year, which ends June 30, the Maui medevac budget is at $2.9 million. Next fiscal year it is $3 million, said Bronstein, chief of the Emergency Medical Services & Injury Prevention System Branch. At the ceremony, Bronstein called this a good example of a public-private partnership. The only other similar service statewide is on Hawaii island, Bronstein said after the ceremony. But there, a helicopter is used for medevac services as well as for the Fire Department. 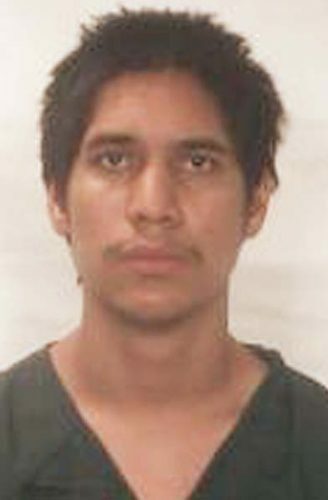 Michael Rembis, chief executive officer of Maui Health System, which operates Maui Memorial, said that unfortunately the island has numerous traumas. “The helicopter is going to be a blessing to this county,” he said. Cheyanna Costa heads to a win in open barrels. Kaelynn Rice makes her way around the course as she wins K-4 barrels. Double mugging champions Souza and Joey Maldonado compete.